Fans of Wizards of the Coast's classic horror board game Betrayal at House on the Hill will soon be able to make the game a little eerier thanks to WizKids� new Upgrade Kit, releasing in September. 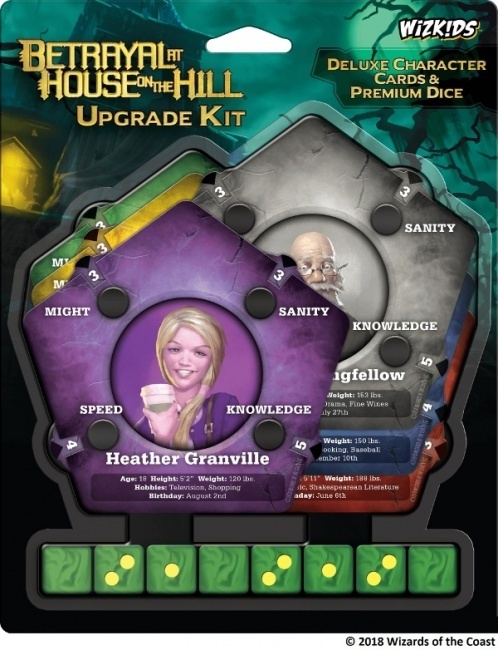 The Betrayal at House on the Hill Upgrade Kit features a full set of six double-sided character cards with built in dials to make it easier for players to track the ever-changing attributes of their characters. The cards also sport all-new artwork depicting the characters from the base game. In addition to the character cards, the Upgrade Kit also includes a set of eight premium dice for use with the game. The dice are molded in a green pearlescent plastic with bright yellow pips.